Oreo Milkshake | Summer Specials! Lemon Juice | Summer Specials! Watermelon Juice ! Summer Special! Paneer Manchurian | Dry Version ! Rava Oats Upma with Moong Dal | Diabetic Recipe! 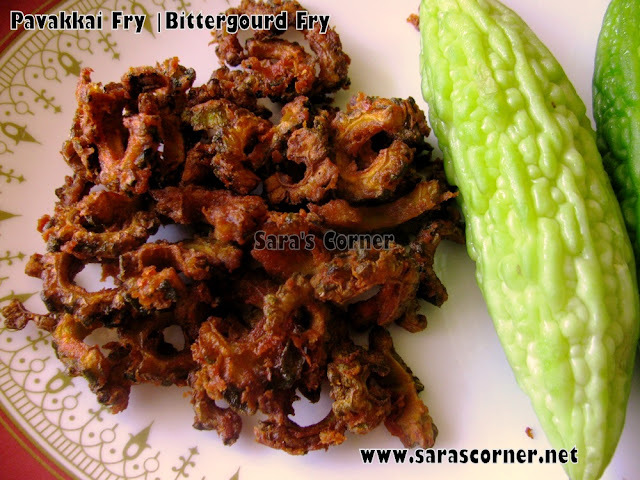 Pavakkai Fry | Bittergourd Fry! I love Pavakkai/Bittergourd, mostly I prepare Curry or Pitala with it, I had posted previously Pavakkai Urulai Curry. Then I remembered when I was working in ITC Office, they used to do this fry in the canteen, its so crispy and just perfect for Rasam or curd rice. Oil for shallow fry or deep fry. Wash and slice pavakkai (refer other names above) into circles, remove seeds or you can keep it. Sprinkly rice flour, corn flour, red chilli powder, hing and salt. Sprinkle little water and leave it for 10 mins. Heat oil in a wok/Kadai, when its hot, drop them and deep fry till crispy golden brown. Remove on a tissue paper and store in air tight container when its cool. Enjoy Pavakkai Fry with Samabar/Rasam or Curd Rice. You can also just munch with Coffee/Tea. Nice crunchy fry, a coincidence, I too posted pavakkai fry today..
Crispy fries...perfect with rice and sambar.. I basically hate bitter gourd, but this one tempts me to taste one...thx for sharing! 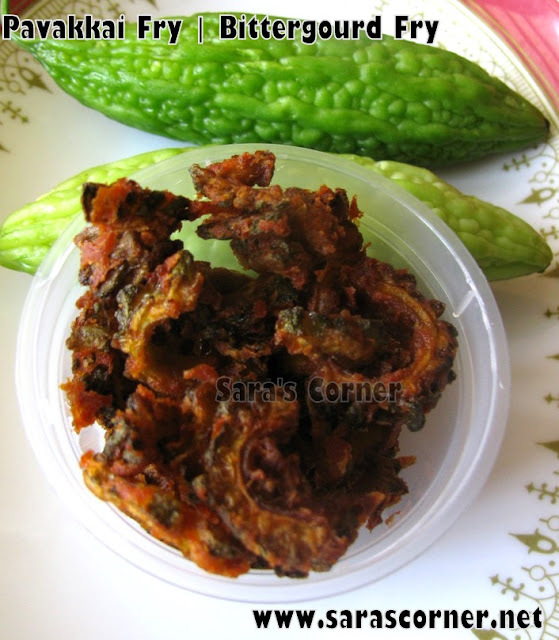 This one is my favourite.. nothing can beat this crunchy fried karela..
very yummy and tempting fries. Bittergourd fry is so crunchy and perfect to munch around sara. Pics are neat and tempting. new to this hence bookmarked. my favourite....but i wont add rice n corn flour...will try nexttime..looks crispy! my hubby likes bitter gourd, nice recipe and lovely presentation! Add crisps in life, i want to ask you for a tip, how could i maintain the crisp of fried food. Hope you will understand my question.